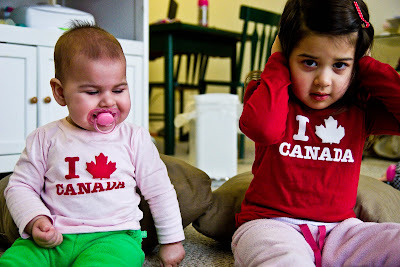 - Get stoked about the fact that the Olympics are going to be held in the land of your birth, the True North Strong And Free....you know, Canada. Land of the beaver, home of the Sutherlands. - Explain (patiently. 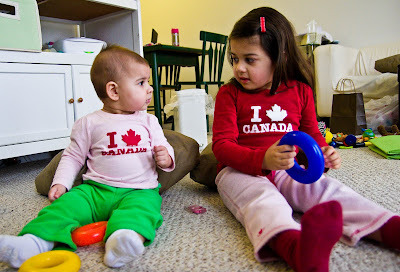 And in small words) to the littles that even though we don't live in Canada we are still Canadian. 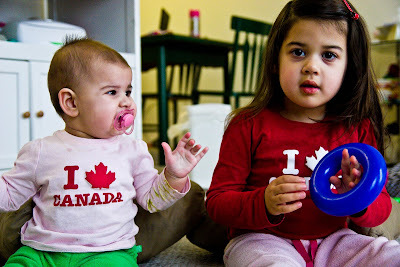 As such, it is our patriotic duty to show some Canadian pride during the Olympics. Resist the temptation to break out into a stirring rendition of your national anthem because you know it will probably just freak the kids out. But you can break out some maple syrup to get them all fired up. 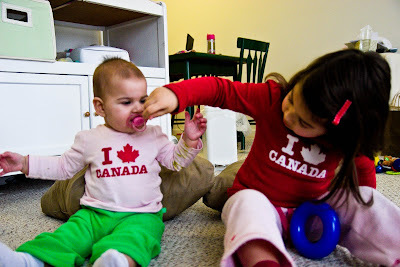 - Set the scene for the cutest We-Love-The-Olympics photo shoot ever by dressing two unwieldy children in matching, freakishly adorable Canadian shirts. Realize you don't have matching pants because someone puked on theirs. Improvise. - Check the clock as the baby starts to whine - crud, it's already naptime! Clearly the set-up took longer than expected. Still, a couple of clicks is all it will take to document how much FUN we are having. Right? Right? WRONG. - Heave a sigh of relief (like Inara's doing in this next picture). It's kinda like the torch malfunction...not a perfect situation, but still salvageable, right? Right? 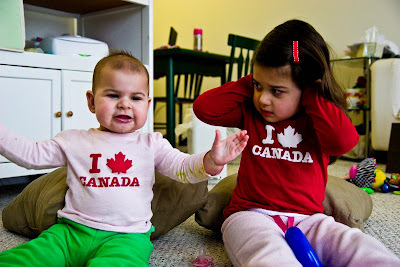 - Decide to finally call it a day when your understandably distraught daughter exclaims: "I just want to STOP! I DON'T LIKE the Olympics! 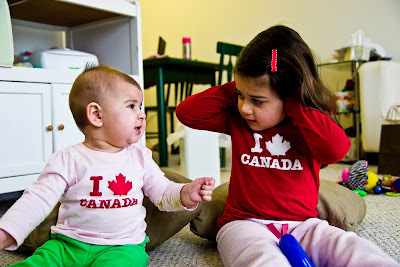 And I DO NOT LIKE CANADA! 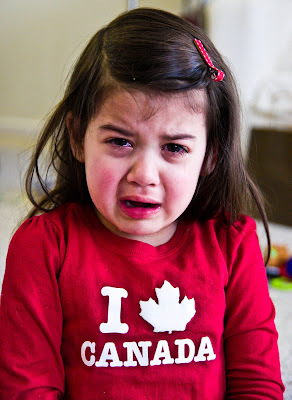 I don't WANT to be a Canadian ANYMORE!!!" Above: The very picture of patriotism.